It is often said that the best things in life are worth waiting for, and in the case of my first Singapore Sling cocktail, I’m inclined to agree. Last Saturday morning we got up early as we were conscious that we didn’t have days of honeymooning to enjoy, merely hours. Over breakfast we made a plan of all the things that we wanted to do on our last precious day in Singapore. Despite there being a number of great museums and contemporary art galleries to visit, we decided that contrary to our normal custom of seeking out the arts and culture, we would instead devote the entire day to hedonistic pleasures starting with lunch at Raffles Hotel. The morning was spent walking about (a rich and rare treat these days) and taking in the sights and sounds around us. I know this sounds totally silly, but I’d almost forgotten we’ve got Christmas coming soon as there’s no sign of it of course in Jakarta. Everywhere there were Christmas trees, lights and decorations, festive window displays and Starbucks selling the ‘holiday’ drinks like back home, but instead of Gingerbread Latte, and Eggnog, these were replaced with the Frappucchino versions. 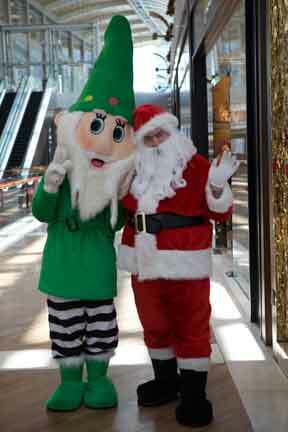 Shops and malls blasted out Carols wherever we went and it all seemed rather surreal and incongruous as the sweat trickled down our backs and the blazing sun beat down upon the baubles and tinsel. Around midday it was definitely time for some hedonism so we made our way to Raffles Hotel that conveniently, was only just a few stops away on the MRT. 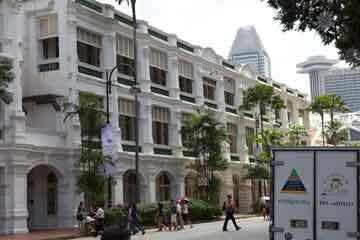 Raffles Hotel is quite rightly considered one of the finest hotels in the world. Built 124 years ago and named after Sir Stamford Raffles, Singapore’s founder, this magnificent colonial hotel has attracted visitors from all over the world since it opened in 1899. Many famous people have stayed at Raffles, Ernest Hemingway, and Somerset Maugham being just two of them. 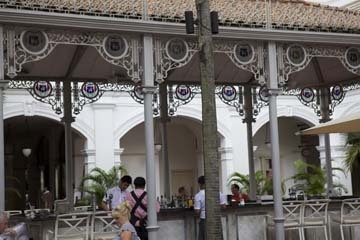 Sitting outside in the tropical garden courtyard and sipping on Singapore Slings (the signature cocktail of Singapore and yes, you’ve guessed it, invented by one of the barmen at Raffles many years ago) it was not difficult to imagine how life here might have been in colonial times. Sadly, these days, the chic, elegantly dressed women and dapper gents of that period have been replaced by a preponderance of rather crusty geriatric ex-pats whose lack of sartorial elegance is quite evident given the horrendous display of white socks, open toed sandals, baggy shorts and t-shirts for the men, and for the women, lurid patterned elasticated-waisted skirts and Clarks sandals. Very uneasy on the eye, though I’m sure there are some extremely stylish people who frequent Raffles, just not on the day we were there. I also could have done without Shania Twain belting out whilst I enjoyed my ‘Raffles’ moment so being a bit of a ‘crusty geriatric’ myself I asked for the music to be turned down so we could listen instead to the babble of Myna birds as they flew from tree to tree and swooped down occasionally to peck crumbs of the diners tables. Having finished our first ever Singapore Sling it would be madness not to order another so throwing all caution to the winds we did, plus some mouthwatering Dim Sum for lunch. Before I leave you with my musings on Raffles, I just want to recount to you the very sorry tale of the tiger. 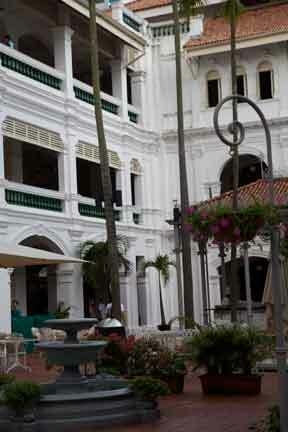 Rumour has it, that Raffles Hotel was where the sole surviving tiger in Singapore was shot dead. This poor beast was kept by a traveling circus that happened to be touring in the city at the time. The tiger made his escape from the circus and ended up at Raffles whereby he was chased through the bar and billiard room and eventually cornered in the Long Bar and shot dead on August 13th 1902. And in case any of you would like to make Singapore Slings at home, I copied the ingredients of the ‘Cocktail Menu’ and they are as follows: Gin, Cointreau, Grenadine, Angostura bitters, lime juice, crushed ice, a slice of pineapple and a maraschino cherry. I haven’t got a clue what the measurements are but if I were you, live dangerously and put LOTS of everything in plus a couple of extra cherries. Go wild and enjoy! This is brilliant! 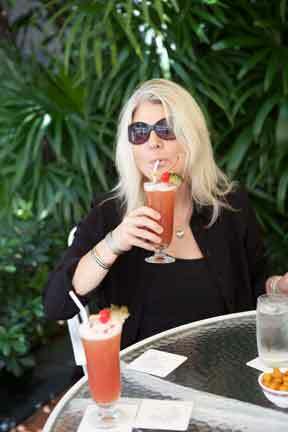 I’m going to make a Singapore Sling and wish I was there.